Click to enlarge via Flickr. Left: front view at Harpers Ferry 2012. Right: back view at Annapolis Comic Con 2012. Fabric and Materials: Black pleather for the fashion fabric, flat lined to cotton twill for the lining. Click to enlarge via Flickr. 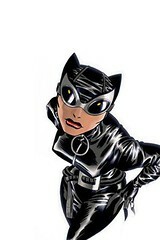 Catwoman cover image by Darwyn Cooke.